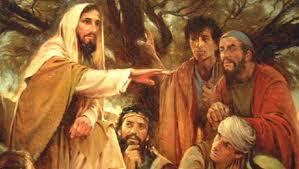 Is there anyone who does not remember his message in his first homily: “Do not be afraid. Open, I say open wide the doors for Christ. On 22nd October 1978, the late Pope John Paul II began his pontificate with these words. This call to a deeper relationship with Jesus Christ is as urgent and necessary today as it was over thirty four years ago, and the occasion of his beatification on Sunday, May 1, 2011 offered us an opportunity to remind ourselves, and others about the witness of John Paul II's life and message. One needs to start with the outcome of his election: after centuries of Italian Popes, the first non-Italian. And to the enthusiastic acclaim of the faithful in Rome and around the world. A new Pope from Poland, a young Pope full of life, enormously capable and very well prepared. This certainly was an extraordinary event. 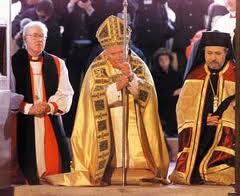 It all took place in the year of the three popes. At dawn on the 29th of September 1978 the Roman Catholic Apostolic Church was in deep mourning for the loss of its second spiritual leader in just 45 days. The Feast of the Transfiguration had seen the passing of Paul VI, now the Feast of the Angels announced the end of John Paul I short reign. Once more, in mid-October, the Cardinals were summoned to Rome to ponder under the gaze of the Almighty in Michaelangelo's Last Judgment whom they would choose to step into the Shoes of the Fisherman, Prince of Apostles. Cardinal Woytyla was elected Pope on the 16th of October 1978 at precisely 17.17 on the feast of St Edwiga, a Queen of Cracow in the early middleages who had died in labour. 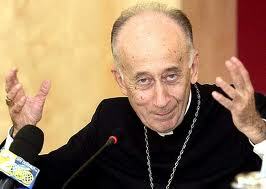 Once again Proto-Deacon Cardinal Pericle Felici announced the election of a pope……. 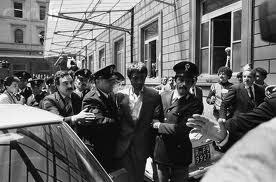 His hesitation over the name perplexed the crowd gathered in St Peter's Square. It was clearly a foreigner who had been elected, perhaps from Africa. However even as he emerged onto the central loggia of St Peter's Basilica, Karol Wojtyla immediately eluded the strict Vatican protocol by going beyond the customary urbi et orbi blessing and addressing the crowd gathered in the square in Italian. He won over the Italians immediately when he encouraged them to correct his Italian if he made any mistakes. 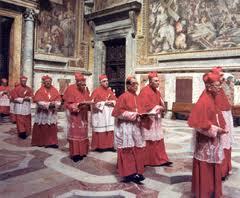 Through this decision the College of Cardinals had shown its intention to change the Church's course…. It was a brave decision and intended to bear much fruit. Open your doors to Christ! This great pope evangelized the world through his writings, through the encyclicals he wrote during his pontificate, through the messages given during audiences he held, through visits to over a hundred countries as well as through his example. His evangelization was Christo-centric, based exclusively on Christ and the Gospels. This was evident in his inaugural speech on the 22 of October 1978 when he had invited us 'To open, indeed to open wide our doors to Christ and not to be afraid of His power. To open also the doors of our states, to open also the doors of the economic, political, cultural and development systems of the world to Jesus Christ.' He had ended his speech recalling that only Christ knows human hearts and minds. Only He has the words of life, indeed of eternal life! 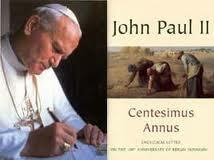 Pope John Paul II signing "Centesimus Annus"
In all his encyclicals his commitment to Christological humanism radiates unmistakeably, a love for Jesus Christ and a profound respect for human dignity. His passion to plumb the depths of human profundity allowed him to encounter and engage directly with modernity. Among the 14 encyclicals which are his legacy to us one cannot fail to mention four which articulate this omnipresent theme to a higher degree: ‘Redemptoris Hominis’, ‘Veritatis Splendor’, ‘Evangelium Vitae’, as well as ‘Centesimus Annus’ which expresses his social doctrine. 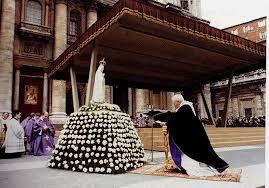 John Paul II had a great devotion to Mary of Nazareth. He founded his Pontificate on devotion to Mary. Karol Wojtyla stated it in this way: "From the first days following my election to the papacy, I felt that I ought to imitate the Apostle Peter who in his time liked to visit everybidy to confirm and consolidate life in the Church through faith in the World. To respond to this call John Paul II made 246 journeys outside the Vatican, 144 of them in various Italian dioceses as well as over 100 journeys outside Italy. During many of these journeys he included visits to Marian shrines where he would halt to pray to the Holy Virgin of Nazareth and seek her aid in dealing with the challenges he faced. 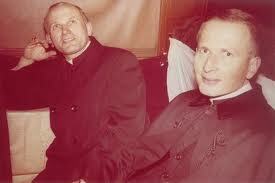 Wojtyla's Marian devotion stems from his childhood from is parents' example. It developed further and continued to grow thanks to the help of a lay person, a tailor by the name of Jan Tyranowski, whom the Pope later described a a man of great spiritual wealth. 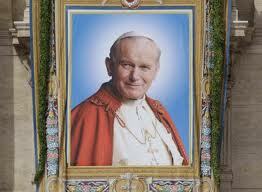 Karol Wojtyla had developed a bond with the Virgin of Nazareth which became an essential part of his personality. He began to love the Madonna when he was just a child thanks to his mother, who, like many Poles, felt a strong devotion to the Mother of God. In his book 'Crossing the Treshold of Hope', John Paul II explains that he was drawn to Marian shrines from his childhood. He would be taken to these holy places by his mother. He recalls the Madonna of Perpetual Succour at Wadowice, the sanctuary at Kalwaria and the Jasna Gora shrine of the Black Madonna. After the loss of his mother his devotion to Mary continued to intensify. According to some observers it was then that he prayed the Madonna to grant him the affection he had just lost through his mother's death. Speaking of his youth he points out that his vocation to the priesthood itself had a strong Marian element. Marian devotion was a principal element of Karol Wojtyla's clerical activities. When we was appointed bishop at the age of 38, he was asked to choose a motto for his crest. 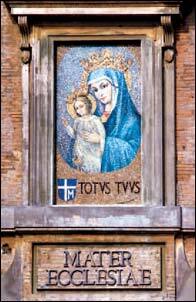 The one he chose was "Totus Tuus" over a cross and the letter M meaning 'utterly yours' and giving expression to the Marian devotion inculcated in him by Jan Tyranowski who had told him of the writings of St Louis Marie Grignon de Montfort and of his motto Totus Tuus. Id-devozzjoni Long before he was called to be bishop Wojtyla had already made this phrase a common place in his writings, in correspondence, in his exhorations. 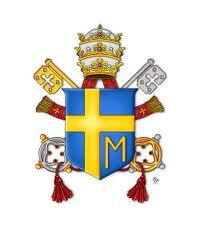 Once he was elected pope he inscribed it on the walls of the Vatican by the crest of his pontificate. It was 33 months after his election that he consecrated the world to the Sacred Heart of Mary precisely in Pentacoste, on the 7th of June, 1981. The faithfulness and dedication of those who expend their energies in apostleship. 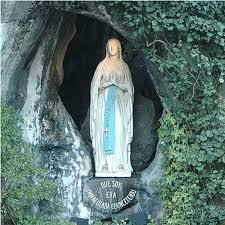 On this occasion he had written a prayer which he had entitled 'The Act of Entrustment of the World to Our Lady '. This event was celebrated in the basilica of Santa Maria Maggiore in the 1600th anniversary fo the first Council of Constantinople and of the 1550th anniversary of the Council of Ephesus. To brighten the face of her Son, Our Lord Jesus Christ. 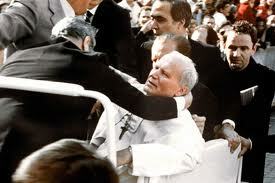 Months later he had obliged the Secretariat of State to reveal the Third Secret of Fatima….Wojtyla was also utterly grateful to the Mother of God who saved his life on the 13th of May 1981 when Mehmet Ali Agca shot at him while he was meeting the faithful before the Wednesday Audience in St Peter's Square. 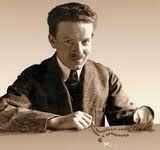 He had donated the bullet which Agca shot at him and which had been surgically extracted from him to Our Lady of Fatima. It was eventually placed in her crown. All his life he lived the spiritual reality of Our Lady as though it was a physical reality. For him Our Lady was a physical person and thought of her as though she were a member of his family. He was not only devoted to her but enamoured of her personality and he lived this thought most intensely. ‘Nobody thought an attempt would be made on the life of an innocent man, a man of peace and above all in St Peter's Square. 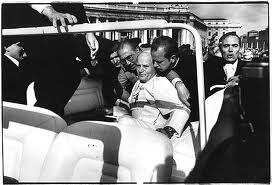 Thirty years have gone by since the attempted assasination of John Paul II. It was precisely on the 13th of May 1981 when Pope Wojtyla emerged onto St Peter's Square for the General Audience which used to be held at five in the afternoon. The white car he was in moved slowly on a narrow path between two barricades. 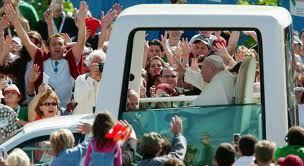 The Pope was standing pleased to greet the crowd which had come that day. He shook the hands outstreched towards him. At one point he even lifted a little blonde girl, embraced an kissed her before giving her back to her mother. Suddenly a pistol was seen above the crowd pointed at the Pope and two shots were heard. The sound of frightened pigeons taking flight occupied the first few seconds of complete disbelief at what had just happened. The first shot broke one of the Pope's fingers and entered his abdomen while a second shot struck his jaw and ricocheted to wound two bystanders. It was nineteen minutes past five of an afternoon to be recorded in the history of humanity. The operation lasted over five hours. The shot had damaged several of his internal organs. Within minutes of the attack, the would-be assassin was caught by a nun who was assisted by the crowd. He was a Turk, Ali Agca, involved with the Grey Wolves, an extreme Left terrorist group also involved in drug trafficing. Agca had already been condemned to death in his absence by a Turkish court after being found guilty of the murder of the editor of the Turkish newspaper Milliyet which two years previously had published a letter from Agca threatening to kill the Pope if he did not cancel a proposed visit to Turkey. Two years later two days after Christmas 1983 John Paul II visited Agca in prison to grant forgiveness to one who had wanted to eliminate him from this earth. The two men spoke alone for a long time and it remains unknown to this day what was said. ‘The attempt was intended to kill him. The bullet went right through his body. He was a man of mysteries…great mysteries but protected. 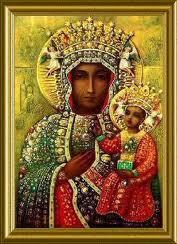 Guarded by God an Our Lady to whom he was so devoted. Agca was subsequently condemned to life imprisonment by the Italian courts for having attempted to kill a foreign Head of State. In 2000 Italian President Carlo Azeglio Ciampi had granted an amnesty to Agca who was immediately extradited to Turkey where he continued to serve another prison sentence. On two separate occasions, the first of which five days after the attempt on his life while he was recovering at the Gemelli Hospital and reciting the Angelus broadcast to St Peter's Square, Pope John Paul II had said; "I pray for my brother who attacked me and whom I have sincerely forgiven". He repeated these words of forgiveness to Agca when he visited him in Rebibbia prison in Rome, on the 27th of December 1983. For several years investigations were carried out in order to establish who had been behind the cowardly attempt on the Pope's life. 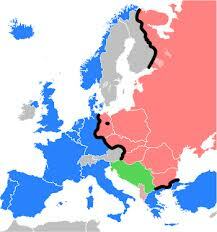 The prime suspects were the secret services of a number of Eastern European countries. 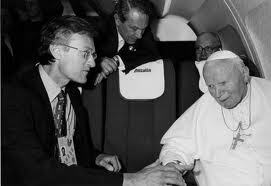 In 104 journeys outside Italy, leaving aside the 144 voyages within Italy, Pope Wojtyla visited 129 countries in just over 26 of his Pontificate, a distance equivalent to three times for the Earth to the Moon or 30 times around the earth. 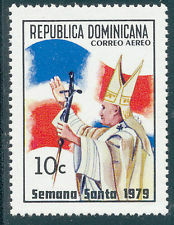 His first journey coming just 3 months from the commencement of his Petrine Service on 25th January 1979 was to the Dominican Republic, Mexico and the Bahamas. His final voyage, a little over a year before his death, took him to Lourdes for two days, the 14th and 15th of August 2004. 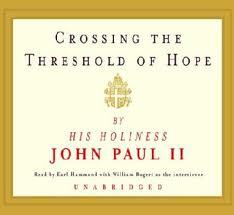 Between these two voyages John Paul II had made close acquaintance with much of the world. From Pakistan to S.Africa, from Papua New Guinea to the Solomon Islands, to Alaska, Bangladesh, Armenia, the Seychelles several times revisiting Latin America, Europe and the United States. Some destinations remained off limits to the globetrotter Pope who on returning to Muaritius once said that he travelled so much in response to the challenge to the Church made by the Holy Spirit in Vatican Council II. His journeys had two contrasting sides to them. He was glad to respond to the crowds who flocked to meet him but then found the occasion for profound solitary prayer as at the Church of the Nativity at Bethlehem or at Lourdes when he asked those who journeyed with him to allow him a time of silent prayer in the cave of the apparitions to be alone before the Mother of God. 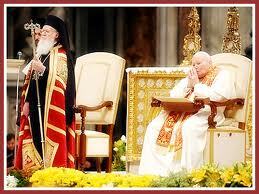 However John Paul II never managed to visit Russia and meet the Orthodox Patriarch of Moscow. Tensions between the Christian families prevented him from bringing about a meeting he very much desired, a desire he never concealed. 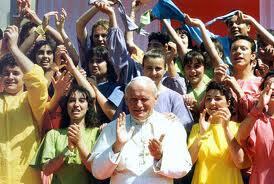 China too remained an unexplored continent for Wojtyla's Church which only today can make a few tentative approaches. Also in Asia, Vietnam has only just acknowledged the accreditation of the Vatican's first Apostolic Nuncio in 2011. John Paul II will be remembered particularly for his personal style. He always expressed himself by seeking direct contact with people. He visited every country that invited him including thise where Christians are in a minority such as Thailand where he brought an evangelical message of courage and persuasion. He did so because he wished to share with the world's people his vital conviction, his faith in Jesus Christ. He wanted to stay in touch with local Churches in order to urge them to respond to the call to sanctity. He wanted to spread the Good News particularly in the continents which had not yet heard it especially in Asia and Africa. While it is true that Christianity has a historical tradition in the West thus should not be taken to mean that His following is still numerous. The world's population has reached the 6 billion mark. So far 2 billion have heard the Good News, another 4 billion await it still. Just as Jesus Christ had urged his Apostles to use the means available to them to comunicate his message, pastoral service today requires the Lord's servants to make use of available technologies and instruments to reach all humanity. Pope John Paul II made it clear from the first days of his pontificate that he had understood that the proclamation of the Gospels demanded effective and respectable forms and strategies of communication which could stir hearts and lead human consciousness just as the Risen Christ when accompanying the apostles towards Emmaus had made them realise the joy in their hearts through the gentleness of his words and ultimately who He was. The Polish Pope therefore decided that the proclamation of the Gospels should be done in new ways even if they did not please everybody. In fact one of the major revolutions John Paul II brought about in the early years of his pontificate, was his own and the Church's opening up to the international media. He chose and was assisted in this task for more than 22 years by a Spanish surgeon. What did Pope John Paul II do? He had made his choice. He had cast his eye of the special correspondent for the Eastern Mediterranean of the Spanish newspaper ABC. He want his assistance inimproving the communication of the Church. How did he contact him. “One day I had a telephone call, I was at work at my office. The message was clear: I was to dine with the Pope between midday and half past one. I asked my secretary to check it up because I suspected that someone may be playing a trick on me. I was wrong. It was true. During his pontificate Pope John Paul II became a global figure also due to the fact that he knew how to maximise his use of the media whether television, radio or internet. In Poland, Malta or other countries, wherever the Pope set foot, media activity would be altered. The combination of technology and theology made him the Pope closest to the media community in the history of the papacy. Instead of antagonizing the media as some public personalities do, this Pole used the media to transmit his message. Undoubtedly previous popes used various means of communication but John Paul II was the first pope to understand completely that the Church had a great opportunity to reach everybody through the media. Later that year he stole the show when from a theatre in Hollywood he held a conversation with thousdands of young people from 4 cities thanks to satellite communication. What was Professor Navarro-Valls's strategy? ‘In communication you are either proactive or you are restricted to a purely informative reaction policy… this is a losing strategy. 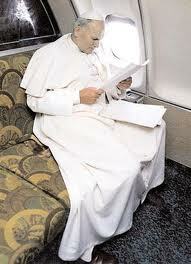 During his pontificate he published several books which were bestsellers. The Vatican also went online and he had his web address. Among his many achievements Pope John Paul II will be remembered as the media friendly pope thus setting new standards for his successors. Quoting from the Vatican Council II decree ‘Unitatis Redintegratio’ Pope John Paul II decalres in his encyclical ‘Ut Unum Sint’ “the change of heart, the sanctity of life as well as public and private prayer for the unity of Christians should be considered the soul of the whole ecumenical movement and may also be called spiritual ecumenism. He also says that love builds unity between individuals and communities. If we love one another, we continue to deepen our union and to perfect it. There can be no worthwhile ecumenism without a change of heart said the Pope. In the same ‘Ut Unum Sint’ encyclical published in 1995 speaking of the Church of Rome and the Ecumenical Patriarchate of Constantinople he writes that the process he referred to could not have commenced without the valuable work of his predecessors John XXIII and Paul VI on one hand and of the ecumenical Patriarch Athenagoras I and his successors on the other. On the 31 of October 1999 the Catholic Church led by John Paul II also signed an important declaration with the Lutheran Church after long years of ecumenical meetings and theological discussions about the declaration of justification. 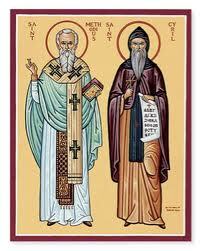 I cannot fail to mention here two ecumenical events in which John Paul II was a protagonist: the Jubilee of 1984 celebrating the eleventh centenary from the evangelization of St Cyril and St Methodius co patrons of Europe and the proclamation of St Benedict as patron of Europe together with the other two saints. The pope was undoubtedly instrumental in in the continuation of dialogue between the Churches of East and West. 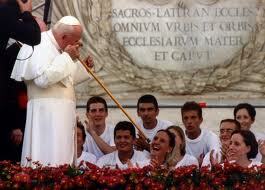 The second event was the most telling gesture by Pope John Paul II for ecumenism during his pontificate. It was addressed to non-Catholic Christians in the year of the Great Jubilee when he had opened the door of the Basilica of St Paul Fuori le Mura which door had been assigned the symbolic role of ecumenic door of the Great Jubilee. Anglikan Primate John Carey and Metropolitan Athanasios of the Ecumenic Patriarchate of Constantinople had helped the Pope open the door in a novel liturgy which had never benn followed in any prior Roman Holy Year. Twenty-two Churches and Confessional Denominations and Christian Organizations from all over the world were represented on this occasion. During the celebration Pope John Paul II had repeatedly asked for union among these Churches. He said that he had heard the call several times during his pontificate such as at Bucharest when he had been convinced that union betweenChristian, Catholic, Orthodox, protestant and evangelical Churches was possible….That day Wojtyla three times invoked the phrase 'unitate, unitate' with great conviction that such a union need not remain on the far horizon. John Paul II's fervent search for Christian unity cannot be described without mention of the jouneys he made to countries where the Christian Orthodox faith drew him in an effort to re-open or consolidate the exchange with the sister Churches of Catholicism. 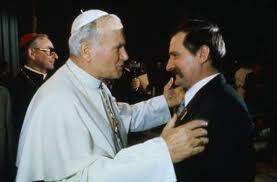 Ecumenism was in integral part of Wojtyla's Petrin Ministry. He spoke of ecumenism in his Wednesday General Audiences, in his recitals of the Angelus on Sundays, in meetings with bishops making their ad limina visits, in letters of accreditation he would write to new ambassadors meeting him for the first time as well as with members of other Churches he met in private audience. 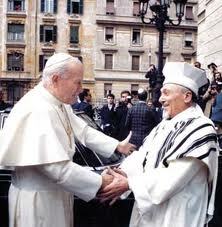 Pope John Paul II was the pilgrim of ecumenism. For him ecumenism was a permanent vocation of the Catholic Church. Making personl meetings with orther Chuerches and their religious leadership was always on the Pope's agenda when he made his pastoral visits around the world. In April of the following year he had met in private audience with the members and counsellors of the Secretariat for non-christian Denominations. He had later renamed this this Secretariat The Pontificial Council for Inter-religious dialogue. That day, he said: "Pope Paul VI who had established this Secretariat thereby demonstrating his love for non-Christians, was no longer visibly amongst us. I am convinced that there among you who wonder whether the new pope is inclined to devote a similar level of attention to the world on n-n-Christian religions." He answered this question emphatically in his first encyclical redemptor Hominis which he published a month later in April 1979. In this encyclical he note that Vatican Council II had given is view of the world as a map of various religions. He also spoke of the respect shown by Vatican Council II towards other religions and there underscored his own thoughts on the subject; that the non-Christian world is constantly before the Church and before the pope. "We want to serve it (the non-Christian world) well. 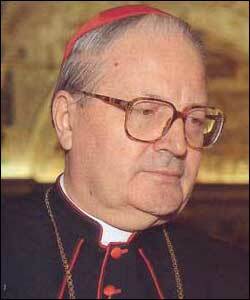 In Turkey in 1979 he had recalled the teachings of Vatican Council II on islam. In 1985 at the Casablanca Stadium he had addressed 80,000 muslim youth: "I believe that we, Christians and Muslims should acknowledge joyfully the common religious values we share and thank God for them. In January a year later, he had visited the monument to Mahatma Gandhi in New Delhi. For a long time we was seen kneeling in prayer before the monument and when he stood up he described Gandhi as the Apostle of Peace. On April 13th 1986 he made a historic visit to the Jewish Synagogue in Rome where he was welcomed by the Chief Rabbi of the Jewish Community in Rome, Elio Toaf. On the 27th October that year, Pope John Paul II had had hosted in Assisi several religious leaders, of whom some from non-Christian religions, to pray for peace.. These religious leaders had gathered around the pope in great friendship, fasted together and at the end of the gathering shared a meal together. The Pope had again met with these religious leaders in Assisi in 1993 when they had prayed for peace in the Balkans and again in 2002 when they had prayed following the events of the 11, September 2001. In Sudan, in Benin, in Uganda in 1993. In Sudan John Paul II had said:" It is necessary to talk about the problems concerning our relations with the followers of a religion as numerous great as Islam." He had approached them with an open mind seeking possible solutions. In 2000 on arriving in Cairo: "The advent of islam brought with it things of great beauty in art and learning that had a determining influence on the Arab world and Africa. In 2001 when visiting the Umayyad Mosque in Damascus, Syria : ‘ As members of a unique human family and because we believe that we have an obligation to the common good, to justice and solidarity, inter-religious dialogue can lead us towards several instances of cooperation principally in helping the poor and the suffering." In al this, this son of Poland always sought ways of building bridges towards union with everyone. 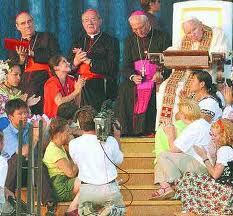 Tor Vergata, Rome, 19th August2000: the Pope prays with 2 million young people from all over the world at times he appeared to be moved greatly during that Roman summer evening. As it drew to a close Karol Wojtyla sand and danced with them despite the onset of Parkinsons disease. 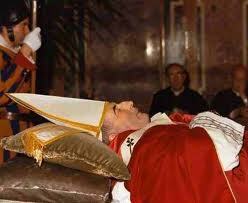 The Pope was clearly ill but still full of a youthful enthousiasm. This was one of the most powerful images of the Polish Pope who always kept a special place in his heart for young people whom he described as 'humanity's anchor of salvation. How can anyone forget, for example, the thousands of young people who flocked to St Peter's Square on 2nd April 2005 to sing and pray when John Paul II was travelling to his Father's house? "In Poland they say that the Pope used to talk of communism but didn't understand it. He had never understood how communism worked. But now a Pope from a communist country had been chosen who knew how communism worked. From a theoretical as well as a day-today perspective. he had lived it. There was a time when they had denied him a passport, at the time the political authorities were very much concerned. In truth this was only the beginning of a rebellion against communism and it was practically the only workers' revolution carried out not through negative words but through the Mass, through Our Lady, with the Pope….I believe that Polish workers gave a splendid example. ". "it was the most important journey. 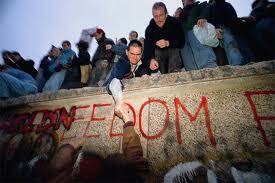 Because a direct confrontation with communist doctrine had taken place. The communists used to say that religion was alienation oppressing the individual. They used to try to separate the individual from religion to free him. Nevertheless, in Warsaw, the Pope decalred that man withut Christ understood nothing…only Christ freed us…Christ allowed us to perceive our individual personality. 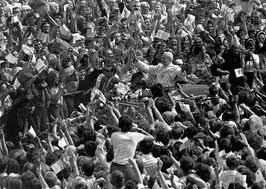 Just months after his election to the Papacy, in 1979 john Paul II had returned to his homeland in pilgrimage, to Poland where he was given a memorable welcome by millions of Poles. That day, although he had tried to avoid confrontation with the Polish authorities, political observers noticed that from his first step towards his native land he had begun to overcome the censorship policy maintained by the Polish authorities. He had ubderscored the need for cooperation between the Church and State and that the State had to begin to respect individual dignity. Frank Zammit with Cardinal Jose' Saraiva Martins, C.M.F. 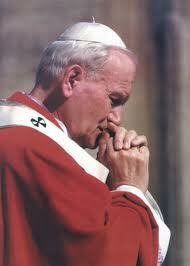 "One thing which used to impress me in John Paul II was his closeness to people. People were to him the path of the Church. In his first encyclical 'Redemptor Hominis' hes says that Man is the path of the Church….in fact John Paul II throughout his pontificate was always close to people, next to people, to defend their dignity, to defend their fundamental rights…inalienable and non-negotiable rights.” H.E. Card. Jose’ Saraiva Martins’ C.M.F. In that first 9-day voyage to Poland, he ws often heard to invite the Holy Spirit to renew the face of the earth! During the 80s the Pope kept a close watch on what was going on in the countries of E.Europe under communist rule, while giving his unfailing support to the trde union Solidarnosc let by Lech Walesa which acted as the opposition to the communist government of Poland. It was a time of great political drama! Who would have guess what the future held for the Soviet Union. The seed of all this drama had been planted when the Cardinal of Cracow, 58 –years-old, relatively unknown compared to other cardinals who had entered the conclave as potential candidates, was elected Pope. Meanwhile towards the second half of the 80s, under the leadership of Mikhail Gorbachov, there appeared the first signs of what the Pope had told the Umbria bishops when they were making their ad limina visit to him some years before. There began to show the first cracks in the Russian leadership. 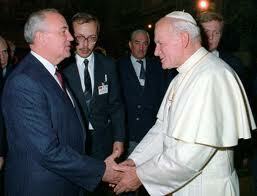 Also thanks to the wisdom of President Gorbachov the antagonism between Russia and the Holy See began to fade away. One cannot forget when on the 20th of February 1988, a red Army Choir had sung the Ave Maria in the Vatican before a Polish Pope. In 1988 Mikhail Gorbachov had permitted and promoted the celebration in remembrance of the 1000 years of Christianity in Russia and the Ukraine. Although he was an atheist, Mikhail Gorbachev had decided to legitimate the right to private worship in the Soviet Union. 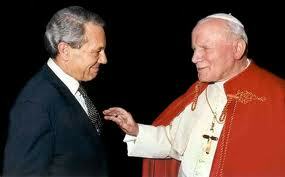 Meanwhile Pope John Paul II began to show an interest in meeting the Soviet leader Mikhail Gorbachov. 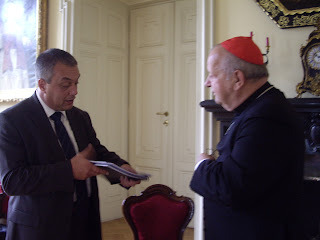 It is said that first contacts made to bring this meeting about were done by the former secretary of State of the Holy See cardinal Agostino casaroli and the Principal Spokesperson to the Holy See Professor Joaquin Navarro Valls. Gorbachov says that at this meeting there had been an emotional exchange. The Pope's first words were that he was very critical of communism. The Soviet leader tells that the Pope alsi tried to discuss the Fall of the Berlin wall at the meeting. The Pope also asked Gorbachov to tell him what he thought of the possibility of European unification and of the possibility of the end of the Cold War. 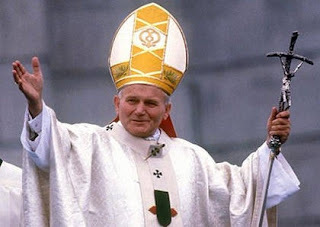 John Paul II: "Europe needed to breathe from both its lungs"
The Pope told him that Europe needed to breathe from both its lungs and could not continue to breathe from just one lung as it had done until then. 'That evening I was dining with the Pope and I asked him: 'Holy Father what impression did u make of Gorbachov? He told me:'Gorbachov seems to be a man of principle. Naturally I asked again:"What is a man of principle?" and he replied: "A man of principle is a man who believes in a number of principles which he respects such that he bears all their consequences even when these consequences are not to his liking. At that meeting the Pope had expressed concern and criticised capitalism. John Paul II ended his message to the Soviet Leader by saying that he served no political party but God and that his aim was to achieve the objectives he wanted to attain through his perestroika. Gorbachov, at the end of his exchange with the Pope said that he too had a criticism to make. When the Pope and Gorbachov had come to the end of their meeting, John Paul II told Gorbachov that he was praying hard for him. the day after the meeting Mikhail Gorbachev had flown to Malta to meet US President George H.W. Bush in the summit at which the US and Russia had declared that they no longer considered one another as antagonists and thus ended the Cold War. Regarding the fall of the Berlin wall I also have the testimony of Cardinal Angelo Sodano who served John Paul II as his Secretary of State. 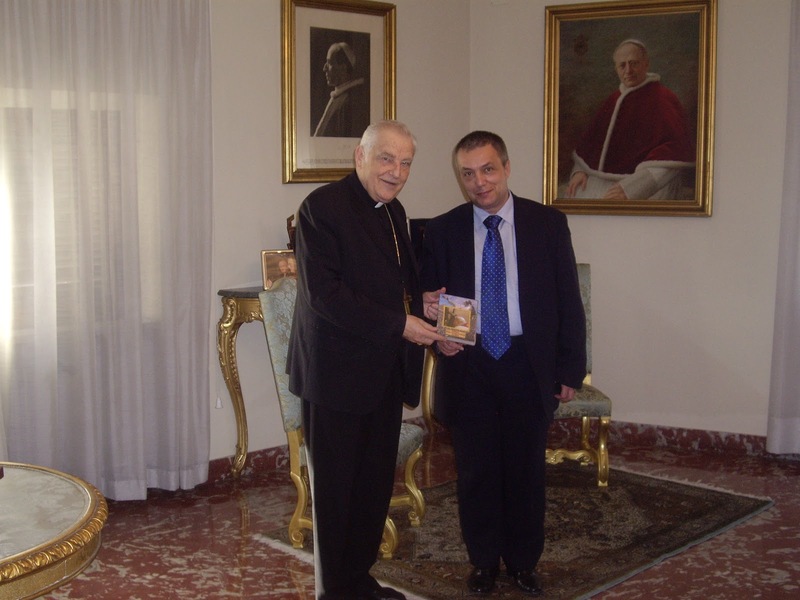 Cardinal Sodano once told me that President Gorbachov had told him that among the causes of the fall of the Berlin wall was the work of Pope John Pual II in defence of human rights. When he heard of the Pope's death, former Soviet President Gorbachov, in sorrow at his great loss, had recalled how brave this Pole had been in their first meeting. He also said that all that had taken place had occurred through the will of God. 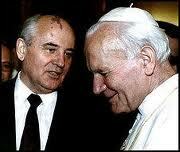 Gorbachov had ended by saying that Wojtyla had set a great example to everyone. Among the thousands of personalities from every social level whose sainthood the Roman Catholic Apostolic Church has recognised, during the pontificate of Pope John Paul II, we find that of Sr Faustina Kowalska a Polish nun from Cracow. ‘St Faustina Kowalska was one of the most extraordinary figures, the most significant, the most fascinating of contemporary Christian hagiography. Sr Faustina was defined in various ways, such as the Apostle of Divine Mercy, as the prophet of our times, as a mystic and teacher of spirituality. 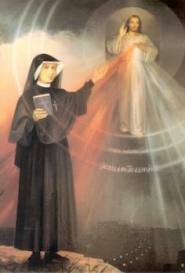 The writing of Sr Faustina for the depth of her union with God and also for the mystery of Divine Mercy for mankind.' - H.E. Card. Jose’ Saraiva Martins, C.M.F. Karol Wojtyla first heard the name of this nun from a seminarist colleague of his at the clandestine seminary they attend years before he was ordained priest. 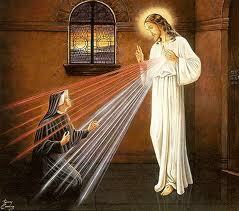 He had been told about Sr Faustina, the Polish mystic who received messages directly from Jesus Christ about his mercy. This young seminarist would later be known as Cardinal Andrzej Maria Deskur, who was a close frined of Pope Wojtyla and one of his closest collaborators during his pontificate. Deskur who passed away in September2011 , and who lived at the Vatican was a primary source of information about Sr Faustina and was instrumental in her cause for sainthood. In evidence given many years ago by the Superior General of the Congregation of the Sisters of Our Lady of Mercy, Sr Pauline Slomka had revealed that when he was a priest and also when he was Bishop of Cracow, Karol Wojtyla would often visit the convent where Sr Faustina had died and was buried. 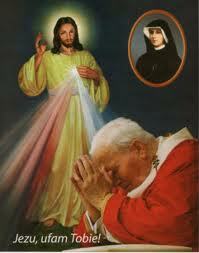 But what was John Paul II's relationship to Divine Mercy? In Rome a few hundred metres from St Peter's Square one finds a sanctuary properly dedicated to Divine Mercy, a temple dedicated to the Holy Spirit in Sassia. The reliquary of Sr Faustina Kowalska is preserved there, that of the propagator of Jesus of Mercy who was of Polish nationality and was the first saint canonized in the third millennium. 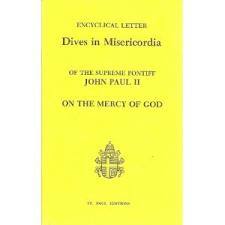 John Paul II's encyclical "Dives in Misericordia"
John Paul II wrote the encyclical Dives in Misercordia, the second of his pontificate which is wholly intended to spread the message of this Polish nun. He proclaimed he a saint on the 30th of April 2000. He tells us that when preparing this encyclical Pope John Paul II had meditated for long and was close to this nun he so wished to canonise. On the 10th of April 1991 before the Church had recognised the beatification of Sr Faustina, Pope John Paul II had spoken about this nun. He had shown the great respect he had for her, again referred to the encyclical Dives in Misericordia and emphasised the role to promote the message of God's mercy for the world. The words of the encyclical Dives in Misericordia are particularly close to us. The remind us of the figure of this servant of God, Sr Faustina Kowalska. This simple religious woman had delivered the message of Easter, of Christ's mercy closer to Poland and to the rest of the world. “I certainly feel that my mission does not end with my death, but begins with it", "And so it was" said the Pope: "Her mission continues and bears innumerable fruits. It is a marvel how her devotion to the Divine Mercy is spreading through the contemporary world and is winning so many huma hearts." It was on Sunday 30th April 2000, on the Feast of Divine Mercy that Pope John Paul II canonised Blessed Sr Faustina Kowalska whom he had described and a great Apostle of Divine Mercy. It was then that he had also canonised the Message of Divine Mercy and the devotion to it by declaring the second Sunday in Easter as the Sunday of Divine Mercy for the Universal Church. In one of his homilies, Pope John Paul II had repeated for three times that Sr Faustina Kowalska was a gift from God for our times. Through this message Sr Faustina had built a bridge for the third millennium of Christianity. He exhorted everyone to raise their voice as one for Our lady, the Divine Mercy and with Sr Faustina who had made her life a hymn of mercy. When the beatification of John Paul II took place on this feast day it had a great significance as Fr Joseph Barth, rector of this sanctuary explains while emphasising the intense bond of John Paul II to Divine Mercy. Even giants ask for forgiveness also because they are aware that at some point history will judge them. The Pope who had come from afar was prepared to ask forgiveness for various mistakes the Church had committed in the course of history. 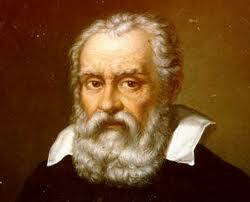 The first open wound which John Paul II wanted to see healed bore the name Galileo Galilei. He announced that he wanted the issue revisited during an event at the Pontificial Academy of Science commemorating Albert Einstein in 1979. John Paul II did not mince his words: "The greatness of Galileo is known to everybody but he was made to suffer because of many spersonalities and structures within the Church. As was was done by Vatican Council II I invite theologians, scientists and historians to re-examine Galileo's case with regard to the affront he had suffered hundreds of years ago." Let us see what Cardinal Poupard and Gianfranco Ravasi had to say on this issue. 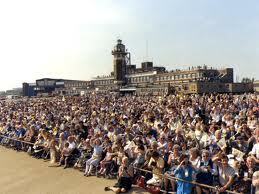 The Year of the Great Jubilee arrived and John Paul II did not stop there. He asked for forgiveness to all who had suffered from all so called "Holy" wars, he condemned the crusades. He asked for forgiveness to all who had suffered at the hands of the inquisition. When visiting Cameroon he asked forgiveness of his African brothers whose fathers had suffered through slavery. Addressing the European Parliament in Strasbourg, John Paul II formally condemned medieval integralism which many popes of that era had endorsed. These requests for forgiveness by John Paul II in the name of the Catholic Church reached their highest level during the Great Jubilee of 2000. It was the 12 of March, 200, the Year dedidcated by the Catholic Church to Mercy, on the First Sunday of Lent, when John Paul II celebrated the mass in St Peter's Square with several cardinals. That celebration on the Day dedicated to Forgiveness had taken place at the Pope's behest as a powerful sign in the Year of the Great Jubilee having the nature of a moment of conversion. John Paul II had said:: As the Successor of Peter, in this year dedicated to mercy, I pray that the Church strengthened by the holiness it received from God kneels before God and asks His forgiveness for the sins of his children committed in the past and in the present. Everybody errs and nobody may feel justified before Him." Through his words and his deeds he taught us and gave us great things but he lesson he gave us from his Chair of Suffering and Silence was no less. Here we recall the image of John Paul II embracing the crucifix in his last Via Crucis in 2005, a picture of frailty, just a few days before he started on his final journey. This journey now will take us to his bedroom in his last day on Earth. “On the last day, in the last hours, the last day, he was conscious. He knew of the last morning of his last Saturday. That Saturday we said Mass. I had presided over the celebration…….over all the praying he did every morning …. his meditiation. After Greeting Cardinal Ratzinger who was the Dean of the College of Cardinals and some other co-workers….in the paternoon he wanted to prepare himself…to prepare himself because he was aware that he neared the end of his life! 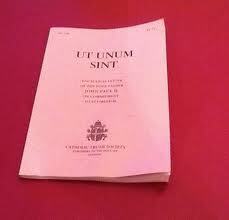 He asked us to read the Holy Scripture which he was used for reading. He used to pray through Holy Scripture. 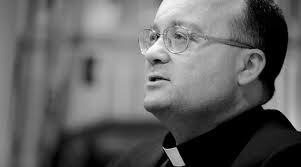 A priest, a professor read him nine chapters of the Gospel of St John. He prepared himself in this way. 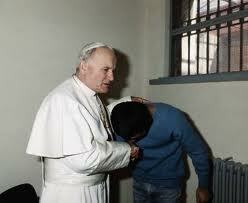 John Paul II's last lesson to humanity was through his example to show us that suffering has a meaning. He left us the interpretation of his suffering which was no theological or philosophical theory but a personal experience pf suffering which grew with him through his pontificate, always aided by the great faith he had in the Christ crucified on Golgotha. Once more, almost twenty-seven years of pontificate, fourteen encyclicals, hundreds of apostolic exhorations, more than a hundred journeys around the world, thousands of speeches on the Pope suffering and embracing the cross, Totus Tuus at the highest level. The highest experience to which a christian may aspire. In this simple phrase lies the reason why John Paul II must remain in the heart of mankind. "The miracle as you know, was extraordinary because this nun was, this French nun was ill, the doctors had said so and not just her own doctor but also some specialists. She had Parkinson's disease for the last five years and was being treated according to diagnosis with medicines which did not eliminate the pain but only relieved it and which did not cure the disease but only controlled it to slow down its course. This nun was a nurse and therefore was competent in this reality, this kid of illness. On the 2nd of June 2005 this nun could bear it no longer. She could not keep on working. Marie Pierre could no longer serve in her profession as a nurse and told her superior that she could no longer work. Her Superior told her to keep on working and to pray for the intercession of the Pope who had just died in 2005. "Let us pray….Let us pray to him who also used to suffer from Parkinson's and hope that he will rid her of this disease." He had died just two months before…. They prayed and the next day Sr. Marie Pierre woke up frre of pain, without restrictions, there was no sign left…she felt freed…so what did she do?....She went to specialists, to her own doctor et etc.. who all confirmed a diagnosis of complete cure. That's all." H.E. Card. Angelo Amato, S.D.B. The beatification of Karol Wojtyla better know and Pope John Paul II 'The Great' was a sign of the depth of his faith and an invitation to the faithful to live a totally Christian life. H.E. Cardinal Jose' Saraiva Martins, C.M.F. "Yes… very gladly, I also had the privilege to be the one to start this process of beatification immediately after the Pope had dispensed with the five year requirement after death in order to initiate a process of beatification. The Pope made his dispensation on the 3rd of May 2005 and after, on the 9th of May, I as the Prefect of the Congregation of the Causes of Saints, signed the official decree to immediately initiate the local diocesan phase of the process of beatification that is to say in Rome and in Cracow My decree was the forst official announcement, so much so that that on the 13th of May the Pope had announced to the Roman clergy in a meeting with them about the beatification of John Paul II. How had he announced it? He read my decree.. The Pope was with Cardinal Ruini but Pope Benedict XVI announced it by reading my decree.. where I had said that the cause should stat at once….So this was wonderful news…Afterwards, under my guidance the whole local diocesan phase was developed over about two years. Between 2005 and 2007.. It ended when I was still prefect and therefore I had signed another decree…I had approved all the research done in those two years.. So for me it certainly was a grace, a privilege, from the official beginning of the process accompanying also in the fundamental diocesan process." H.E. Card. Jose’ Saraiva Martins, C.M.F. "Saints are those people who are most human. Humanity above all…saintliness is the fulfilment of humanity. 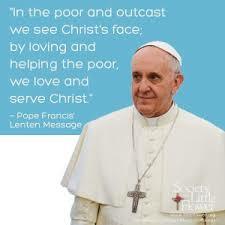 Saints are those who live their humanity profoundly…We say for example that Jesus was the perfect human…a saint….why? Because he was saintliness itself…So these gifts were clearly in evidence in John Paul II who had an extraordinary humanity arising from his sanctity which brought him very close to mankind..I never tire of saying that sanctity is the fulfilment of humanity." H.E. Card. Jose’ Saraiva Martins, C.M.F. This is what Monsignor Alfred Xuereb had to say…..
“First of all I am struck (by the fact) that when I visit Malta, there are people who tell me to pray for a special grace in their nam when I visit the Pope's grave, They would love to have at least a day in Rome just to visit his grave and pray over it for this grace. Several people have told me afterwards that they did receive the grace. I remember two couples whose marriages I had celebrated and which both had difficulties in having children. One of the women had been to the doctor with her husband and had been told that she had a 1% chance of having a child. Her sister had lost a child just a few weeks into the pregnancy and I think that was for a second time. They both spoke to me of their great difficulties because I had celebrated both their weddings. I had encouraged them to come to Rome where I said Mass for them near his grave and then we went and prayed over his grave… In fact, a few weeks later both were expecting a child. The one with one per cent chance delivered a healthy boy with no difficulty and the other one also took her pregnancy to term and had a baby boy. They now have a son each. 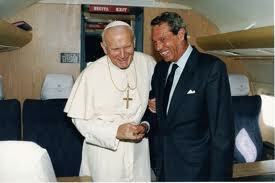 A wonderful experience which I have been able to tell the present Pope who has a great love for John Paull II. Cardinal Angelo Amato explains where the process had reached when he was nominated to the Congregation for the Causes of Saints. 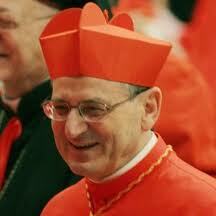 His Eminence Cardinal Angelo Amato, S.D.B. 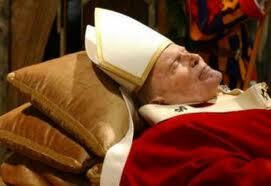 The Blessed Pope John Paul II: He still lives amongst us! 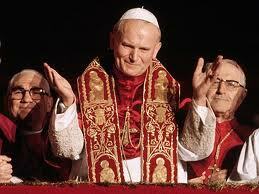 Having served the third longest pontificate in the history of the papcy, John Paul II died in April 2005. He was beatified some months ago. 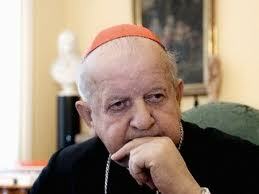 Nevertheless, he will live on with us in this life thanks to a project made by his Private Secretary Cardinal Dsiwisz. The John Paul II Centre ' Do Not Be Afraid!' is a project which was formally inaugurate on the 2nd of January 2006 by Cardinal Stanislaw Dsiwisz, Metropolitan of Cracow. On that day Karol Wojtyla's faithful servant signed the decree establishing this centre and a public an ecclesial organization to be governed by the Archdiocese of Cracow. The idea behind the centre was to create a living memorial to the life of this personality and to the achievement of this Slav pope. It is a living project in the teaching of the Nazarene which reminds us of when He gave us the beatitutdes! This Pope's legacy is an inspiration for everyone regardless of one's religion. On this aspect Cardinal Stanislaw Dsiwisz declared that the aim of this project is to conserve the character of the Pope as he was, in his teaching, in his poetry, in his sensitivity to beauty, but above all in his love for us all. The Centre will also be the final resting place of Polish Cardinal Andrzej Maria Deskur whose remains were brought from Rome to be buried here. 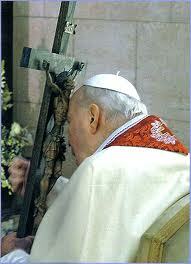 One could not have found a better place for this Cardinal who had been a constant partner to Wojtyla. The name of the centre recalls a phrase uttered by the Pope in the beginning of his pontificate on Sunday 22nd of October 1978: DO NOT BE AFRAID! The Blessed John Paul II "The Great"